105 mm L/45 Tbts LC/163 х 1 pcs. Initial HE Shell Velocity715 m./s. Initial AP Shell Velocity715 m./s. 500 mm Zwilling2 х 2 pcs. Longjiang — Pan-Asian Tier II destroyer. For captains acquainted with the German destroyer line, Longjiang (龍江, "Dragon River") will feel very familiar to V-25; many aspects of this oriental Hochsee-Torpedoboote (ocean-going torpedo boat) will mirror her German cousin, but she is not an identical vessel. Longjiang’s primary weapon are her deep water torpedoes (DWT), used to combat against enemy capital ships: cruisers, battleships, and aircraft carriers. Compared to her German equivalent, she can launch 4 fish every 32 seconds, which can run up to a distance of 8.0 km. In conjunction with her superior concealment of 5.4km and top speed of 36 knots, her primary task is to hunt down isolated and/or unaware warships, surprising them with volleys of torpedoes from a safe distance. With a default torpedo speed of 49 knots, they are relatively feasible for enemies to dodge; to offset this disadvantage, crafty captains should use islands to close the engagement distances to their targets, or choose targets that are preoccupied fighting other allied ships. Her artillery on the other hand is situational, and must be considered secondary to her torpedo armament. Despite the superior fire-rate of 15 rounds per minute, the high shell arcs and average shell velocity make for overall mediocre performance. Longjiang’s guns should not be used as a primary source of damage – other than to attempt starting fires with high explosive rounds – and have few good applications save self-defense from other destroyers. Unlike V-25, Longjiang does not have forward firing torpedo tubes; therefore, no opportunities to engage in “torpedo jousting” tactics favored by V-25 captains. More importantly, her DWT do not work against destroyers. Unless in situations that favor Longjiang, it is imperative to avoid combat with enemy destroyers, as she is inherently handicapped and overall very fragile. If destroyer encounters are unavoidable, captains should consider sticking close to allied ships in order to ensure an advantageous situation. Longjiang provides captains with a user-friendly platform to familiarize themselves with DWT before they progress further up the Pan-Asian destroyer line. Tied for lowest detection range of all ships in game and highest speed of all Tier II destroyers. Can fire torpedoes while undetected. Torpedoes have the longest range of all Tier II destroyers. Among the fastest artillery fire rate of all Tier II destroyers. Tied for lowest hit-points of all Tier II destroyers. Average turret traverse and torpedo reload speed. Does not retain the forward torpedo tubes of V-25. Deep water torpedoes are ineffective against destroyers. Hull: Upgrade to Hull B for increase in hit-points and decrease in rudder-shift time. Research of this module unlocks progression to Phra Ruang. Gun Fire Control System: Upgrade to FKS Type 2 Mod. 2 for increase in range. It is recommended to solely focus on Hull upgrades for captains who wish to progress further up the tech tree. For captains who wish to continue playing Longjiang, FKS Type 2 Mod. 2 is an inexpensive upgrade to research and mount. Slot 1: Main Armaments Modification 1 ( ) will mitigate the chance of torpedo tubes being incapacitated in combat. 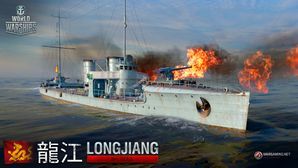 Captains are recommended to focus on two key aspects when selecting commander skills for Longjiang: increasing her survivability or increasing her torpedo potency. She is a fragile vessel with low health and easily damaged modules, so any boost to her damage mitigation will prove beneficial. On the other hand, Longjiang has the ability to trade torpedo distance for speed, and increase reload times; all in favor of increasing the rate of fire of her torpedoes. Captains are encouraged to equip the premium Damage Control Party II ( ) in order to have more opportunities to repair damaged modules. SMS V-43 underway, date unknown. This page was last modified on 24 April 2018, at 22:13.